You don’t get to take any of your upgrades into the DLC from the main game. Ammo and Salts (sorry, “Eve”) are less plentiful in Rapture than they are in Columbia, but this is evened out by a lower enemy count overall. It feels like this was an attempt to make the game feel more like a survival horror or stealth game, but it really misses its mark. The combat still feels like a slog, just a different type of slog. In the end, lack of ammo is really nothing more than a minor annoyance, as splicers are easily dispatched with melee, and Elizabeth is always handy with her tears. Despite the game’s best efforts, you still feel like a golden god of gun and genetics by the end of the game, which punches the noir atmosphere right in the gut. The final bits of Burial at Sea do redeem it in some small way. You get to fight a Big Daddy again, which is one of the highlights of the experience. The final few story revelations are also quite interesting, though they don’t really deliver on the payoff we were promised. 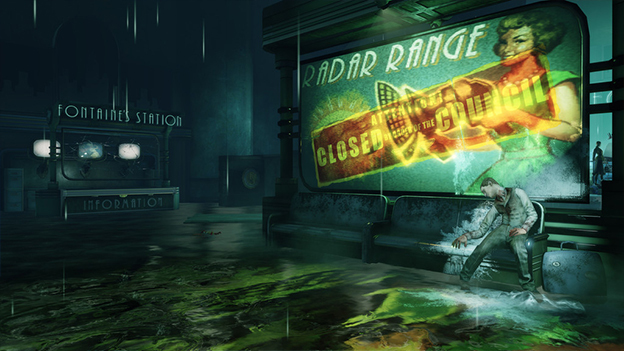 Perhaps we will find out more about Rapture’s inevitable downfall in Episode 2, where we get to play as Elizabeth. 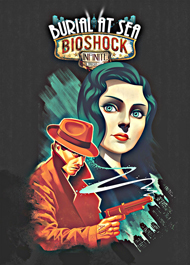 Overall, BioShock Infinite: Burial at Sea Episode 1 is solidly OK. In the end, it’s much more of what we have come to expect from BioShock Infinite, awesome pieces of story broken up by uninteresting sections of combat. It’s not a reimagining of the series. It’s not a grand departure that examines BioShock’s past. It’s really not much more than some more BioShock Infinite with a Rapture coat of paint slapped over it. If that’s what you are looking for, then the 15-dollar price of entry isn’t bad. For everyone else, there is always BioShock 4. The world of Rapture is as pretty, if not prettier, than the world of Columbia. The controls haven’t changed, and they work as well as they did before. The voice actors do an astounding job with the noire theme. The combat is not thrilling, and there aren’t nearly as many stealth and social situations as we were promised. Rapture reconstructed from the ground up. Canonical storyline that ties in with the first BioShock.